It seems like about ten years ago or so every team in Major League Baseball went from having just one hitting coach at the Major League level to two hitting coaches. Eventually the New York Yankees caught up with the times and hired an assistant hitting coach to help out with their crew of sluggers the team employs, and this year will be no different. Last season New York had Marcus Thames in the position but after a promotion for Thames the team needed to fill the position with another former Yankees farmhand, and they did so when the team hired former catcher P.J. Pilittere. Let’s meet the Yankees Assitant Hitting Coach. This is Meet a Coach: The P.J. Pilittere Edition. Peter John Pilittere was born on November 23, 1981 and is the current assistant hitting coach for the New York Yankees. The Yankees are the only organization that Pilittere has ever known as this was the team that drafted him out of college. Pilittere attended California State University, Fullerton, better known as Cal State Fullerton, where the Yankees drafted him in the 13th round of the 2004 MLB First Year Players Draft. 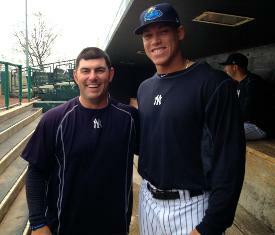 Pilittere toiled around in the Yankees Minor League system until the 2011 season making various stops around the farm. After Pilittere decided to retire he became a coach for numerous teams with the Yankees minor league affiliates before finally landing his first MLB gig here in 2018. I love watching one of the Yankees own not only play through their minor league system, but also work their way through their minor league system all the way to the Major Leagues as either a player, a coach or both. Congratulations to P.J., and good luck in the new position. I have a feeling with this lineup that P.J. won’t need it, but good luck nonetheless.